ON THIS DATE (July 23, 2002) ... History happens on its own time, even when it doesn’t appear on the original schedule. That it should fall on Nomar Garciaparra’s 29th birthday? Purely coincidence. A makeup game today between the Red Sox and Tampa Bay Devil Rays required a makeover of the record book before it was over, with Garciaparra hitting three home runs - two in the third inning, a grand slam in the fourth - and driving in eight runs in a 22-4 win over the D-Rays that had an announced crowd of 33,190 serenading the Sox shortstop with birthday greetings before it was over. The day couldn’t have been more special for Garciaparra and the Sox this afternoon. In a 10-run third inning, Johnny Damon led off with the first of seven home runs hit yesterday afternoon by the Sox, with Garciaparra and Ramirez hitting consecutive home runs in the inning and combining for five home runs, 13 RBIs, five runs scored, and six hits by the end of the afternoon. In the process, they also set a major league record by becoming the first teammates to combine for nine home runs in two games. Damon was on base five times with a double, two singles, and a walk in addition to his home run. Nixon had four hits, including his 14th home run, and Merloni scored four times in front of Garciaparra and Ramirez as the Sox, ahead, 16-4, after four innings, amassed 19 hits, equaling their season high. The 22 runs were the most unanswered runs in an American League game in 49 years, since the Yankees beat the Washington Senators Aug. 12, 1953. The Cubs scored 22 unanswered runs in a 22-6 win over San Diego May 17, 1977. Garciaparra, who hit three home runs (two grand slams) here and drove in 10 runs against the Mariners May 10, 1999, joined Ted Williams (3), Jim Rice (2), and Mo Vaughn (2) as the only players in Sox history to have multiple games of three home runs. He and Vaughn are the only players to have done so in Fenway. Garciaparra hit his first home run over the screen in left off Tanyon Sturtze on a 3-and-0 fastball. It was the second time this season Garciaparra has gone deep on a 3-and-0 pitch, a count on which he never used to swing in the past. Garciaparra had two more opportunities to become the third player this season (Mike Cameron, Shawn Green) to hit four home runs in a game. But he was walked in the sixth by Steve Kent and hit a first-pitch flyball to center in the eighth against Travis Phelps. 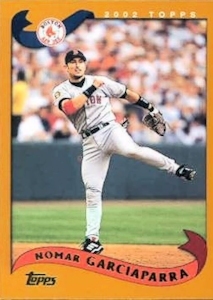 Garciaparra, who homered twice on Sunday against the Yankees, had five home runs and 11 RBIs in two games after batting .185 (10 for 54) with no home runs and six RBIs in 13 games, the worst slump of his Sox career. He went 1 for 5 in the nightcap.